One could certainly argue that midway through Tetro, as the already florid style kicks up a notch, and Francis Ford Coppola’s black-and-white familial fantasia grows increasingly overblown and operatic, the thing runs straight off the rails. There’s an equal argument to be made, though, that it’s only when Coppola cranks up the bombast that this extravagant relationship drama really comes into its own. Boldly stylized from the start, Tetro infuses its Argentinan setting with pregnant atmosphere from its very first scenes. Even as nothing much is happening, as young Bennie is arriving in Buenos Aires , hoping to reacquaint himself with his estranged brother Tetro, Coppola is furiously trying to establish mood. Dramatically, Tetro is both self-consciously excessive and completely earnest. Seventeen-year-old Bennie visits his brother, hoping to glean some information about his family. His anguish is given so much credence that it overtakes Tetro. 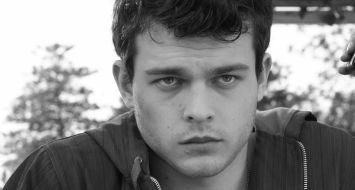 Alden Ehrenreich, who comes off like a young DiCaprio, inhabits the character convincingly, but his virginal, eternally pained, puppy dog demeanor feels like a writer’s device. As he insinuates himself into his brother Tetro’s life, it’s difficult to understand what exactly keeps the family unit bound together, beyond Coppola’s own desperate desire for reconciliation. The operatic pomp and overblown style of Tetro don’t exactly breathe new life into these stale proceedings, but they do somewhat soften the blow of the screenplay’s Oedipal contortions. Shot in a manner that superficially recalls Fellini’s work in the sixties, Tetro is always worth looking at, at the very least. Although the camera here is usually fixed, Coppola’s compositions are varied. The lone visual disappointment, and it’s not an insignificant one, is that Coppola’s choice to shoot on DV undercuts the richness of his photography. What would have been lush, luxurious images become too stark to be in any way inviting under the digital camera’s gaze. One still can’t help but be a bit taken aback by the fact that Coppola, with the complete artistic freedom that being self-financed provides, chose to make this. It’s a sign that he’s always been more a stylist than a man of ideas. There exists in Tetro a desire to tell a small, personal story, it is true. At the same time, there’s a contradictory impulse to inflate that small story. It’s not enough to shoot in black and white. Coppola has to have frequent flashbacks in vivid color, has to make the entire family a clan of artists, and has to make the father figure the greatest conductor in the world. In fluffing his simple tale in this manner, Coppola moves further and further away from its central obsessions of male bonding and self-definition. So, Tetro is a movie that clearly was made to please its maker, first and foremost. Critics are explicitly told off, as the title character tells “South America’s most influential critic” that her opinion “doesn’t matter” any longer. Audiences are likely to be puzzled, as well, by Coppola’s insistence that his privileged characters’ emo complaints warrant such fawning attention. Perhaps Tetro is meant to be autobiographical, but it is governed by an indulgent, insular attitude that diminishes its supposedly universal and timeless themes. His able cast and the power of the script’s strong melodramatic construction are undercut somewhat by this pomposity. Coppola seems impressed with his talent and the world he’s made above all else. This is most obvious in Tetro’s final half-hour, which features too many moments that feel like an ending, giving the impression that Coppola doesn’t want to let go of the world he’s crafted. Coppola is an iconoclast, to be sure, but he’s a remarkably self-aggrandizing, sharply petulant, and seemingly dissatisfied one. In his crusade to redefine himself as a “personal” filmmaker, he seems to be fighting all of the wrong things. In that respect, he resembles Tetro’s titular character. Coppola’s movie, like Tetro himself, is something that must be taken on its own terms, for better or worse. For viewers who are willing to accept the sheer adolescence of Coppola’s thematic obsessions and stylistic approach, however, Tetro shows plenty of questionably placed inspiration.